Nelson Mandela, the first democratically elected president of South Africa in 19194 will be featured in rand currency notes. 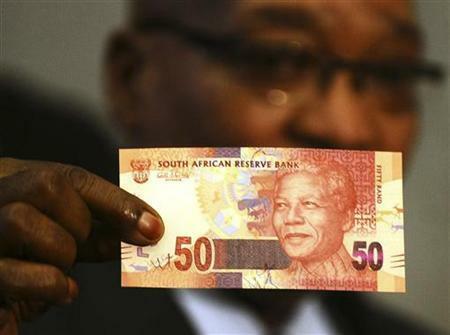 The image of the former President Nelson Mandela who was jailed for 27 years in Robben Island prison will be in the five new notes. President Jacob Zuma, the current head of the government of South Africa disclosed this last saturday which coincide with the 22nd anniversary observance of the release of Nelson Mandela from prison. “It is a befitting tribute to a man who became a symbol of this country’s struggle for freedom, human rights and democracy. 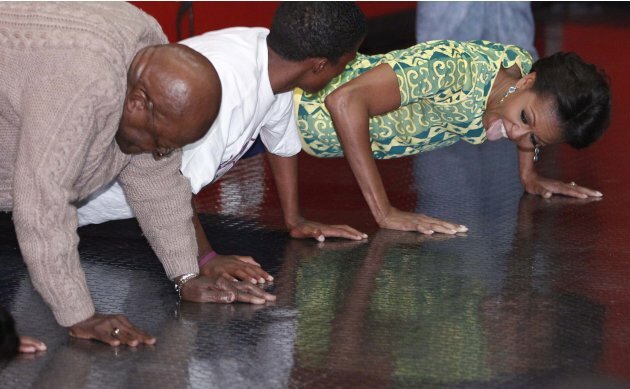 U.S First Lady Michelle Obama ended her week-long visit to South Africa by meeting the Nobel Peace Prize winner Archbishop Emeritus Desmond Tutu - and getting a bit of a workout. They visited the famous Cape Town Stadium in which some of the 2010 World Cup games were played, where the First Lady encouraged young people to protect themselves against HIV/Aids and use sport to stay healthy. Earlier U.S First Lady Michelle Obama visited the former President Nelson Mandela and his wife lady Graca Machel, the former Mozambican first lady at their home in Houghton. She also visited Mandela’s charitable foundation and Emthonjeni Community Center in Zandspruit Township, Johannesburg. "You are VS - very special people," said Tutu in his cheery voice soon after he stepped into the room filled with young people and the media. He encouraged the youth to reach for the stars so that they can be anything they want to be in life.The First Lady began her speech by joking with the Archbishop: "You are also a special person". Obama backed Tutu's words by telling them that one has to be a "VHP" - very healthy person - to inspire very special people. US First Lady Michelle Obama and her childrenwith Nelson Mandela, at this home, in Houghton SA. Then she participated in the sporting activities. She dribbled the ball and did push-ups on the floor beside with the Arch while the children cheerfully shouted out president Obama's famous election slogan, "Yes we can!" Former Bafana Bafana soccer star Mathew Booth was also present at the function. He said he was invited by the group Grassroots Soccer to take part in the project that educates, inspires and mobilizes the youth through soccer. "Meeting both Desmond Tutu and Michelle Obama is beyond what words can explain," he said. Associate Press reported, "Michelle Obama kicked soccer balls Thursday with former Anglican Archbishop Desmond Tutu and flexed her biceps doing push-ups alongside him as she closed out a goodwill visit to South Africa and prepared to head for neighboring Botswana. She also visited a museum that documents the forced segregation of a once racially mixed area of this coastal city. Obama and family members traveling with her, including daughters Malia and Sasha, met Tutu, a Nobel Peace Prize laureate and a leader in South Africa's fight for racial equality, at the new Cape Town Stadium where the World Cup soccer tournament was held last year. She also received briefings from several HIV/AIDS prevention organizations,including some that use the discipline of soccer to teach kids about the disease. In remarks before the soccer drills and calisthenics, the first lady urged dozens of kids to make safe, healthy choices. HIV/AIDS is a serious challenge to South Africa, where between 5 million and 6 million live with the disease in a country of just under 50 million. An estimated 17 percent of adult South Africans are infected. "It's hard to have an impact if you're not in the best condition possible," she said. Her morning visit to the District Six Museum replaced a long-planned ferry ride to Robben Island that was canceled at the last minute due to high winds that made the Atlantic Ocean waters too treacherous to cross." All autobiographies are contrived by their authors to present themselves as they would like to seen by subsequent generations. Collections of contemporary writings and notes are often more revealing because they were not written with the intention of creating this or that historic impression. For this reason I found Nelson Mandela’s recently published ‘Conversations with Myself’ more revealing of the man than his autobiography “Long Walk to Freedom” - and in many respects more moving as well. The book is a relatively unstructured collection of extracts from Mandela’s correspondence, unpublished writings, interviews and items jotted down in his old Satour Calendars. The collection includes numerous reproductions from notebooks and correspondence in Mandela’s bold, rounded and confident handwriting - which changes little over the decades of resistance, imprisonment and, finally, vindication. Although there can be no doubt regarding the frustrations experienced by young militant ANC members at that time, I believe that Mandela’s decision to opt for armed struggle was wrong both in principle and tactically. The armed struggle had limited military significance - but it did escalate the conflict to another level and inevitably resulted in greater bitterness, recrimination and loss of life on all sides. Mandela’s decision also led inexorably to his own arrest and trial in which he and his co-defendants expected that they would be sentenced to death. Mandela launched a vitriolic attack on me after the Boipatong massacre in which he claimed that the ‘unprovoked slaughter of innocent people’ was part of a government plan. The TRC’s Amnesty Committee subsequently found that IFP hostel dwellers had acted alone and that there had been no government involvement. Naturally, I never received an apology. Notwithstanding any criticism one might have, the man who emerges from ‘Conversations with Myself’ is, by any measure, a towering figure, not only in South African history but in the history of the twentieth century. He went on as President to play an exemplary role in uniting and reconciling South Africa’s deeply divided people. FW de Klerk, the last white president of South Africa, is presently is the founder and chairman of FW de Klerk Foundation. Frederik Willem (F W) de Klerk was born in Johannesburg on 18 March 1936. After graduating from the Potchefstroom University for Christian Higher Education in 1958, he spent 12 years as an attorney in Vereeniging before taking the decision to enter active politics. In November 1972 he was elected as Member of Parliament for Vereeniging. In 1978 Mr De Klerk was appointed to the Cabinet. During the following 11 years he was responsible for numerous portfolios including Mineral and Energy Affairs, Internal Affairs and National Education. He was elected leader of the National Party in the Transvaal in 1982. In July 1985 he became Chairman of the Minister’s Council in the House of Assembly and in December 1986 Leader of the House of Assembly. After his election as State President in September 1989, he initiated and presided over the inclusive negotiations that led to the dismantling of “apartheid” and the adoption of South Africa’s first fully democratic constitution in December 1993. 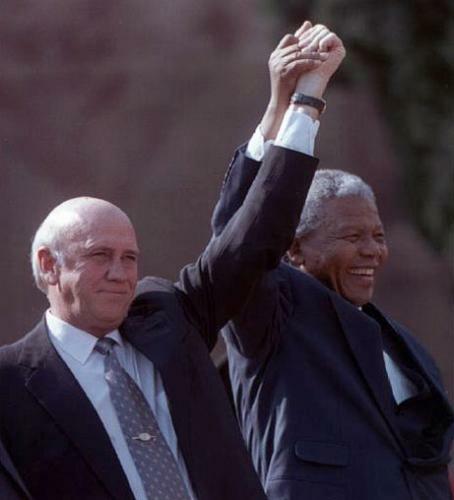 After South Africa’s first fully representative general election of 27 April 1994 Mr De Klerk became one of South Africa’s two Executive Deputy Presidents in which capacity he served until 1996 when his Party decided to withdraw from the Government of National Unity. He was Leader of the Official Opposition until his retirement from active party politics in 1997. Today, Mr De Klerk continues to work actively on the promotion of harmonious relations in multi-communal societies, the future of Africa and South Africa and the challenges facing the world today. In 1999 he established the F W de Klerk Foundation, and in 2004, he brought together a number of respected former national leaders to join him as founding members of GLF Global Leadership Foundation, a non-profit organisation that aims to play a constructive role in the promotion of peace, democracy and development in countries across the world. In addition, he holds positions at the Prague Society for International Co-operation, the Assembly of the Parliament of Cultures and the think-tank Forum 2000 as well as serving on the advisory boards of the Peres Centre for Peace in Israel and the Global Panel in Germany. Mr De Klerk has been awarded numerous honours, among them the Prix du Courage Internationale (1992) and, together with Mr Mandela, both the UNESCO Houphouet-Boigny Prize (1992) and the Nobel Peace Prize (1993). Nelson Mandela: A symbol of freedom to the emerging continent and Mandela has become the conscience of the world. Mandela is a role model for a goodwill mindset; embracing reconciliation, forgiveness and unity in his native South Africa. The troubled continent littered with wars and disturbances needs Mandela's methodology for making sustainable peace. President Goodluck Jonathan: The president of the most populous and influential country in Africa which is Nigeria. He has displayed maturity in tackling Nigerian huge and complex problems. A democrat who has shown credible interest in leading Nigeria to her vision of becoming the richest and most successful democracy in Africa. Prof. Wangari Maathai: A warrior for the environment and has made planting trees in Kenya a point of duty. The first woman in Africa to win Nobel Peace Prize and the founder of The Green Belt Movement. Chinua Achebe: A writer and author of “Things Fall Apart” that delved into the crash of civilizations when colonialism stepped foot in Africa. Achebe is a civic activist and chronicler of African storytelling; he has done more to express African state of mind to the world. Wole Soynika: The first African to win Nobel Prize in literature. Wole Soyinka is a dramatist, poet and civil right activist. Great Soynika is a lion of Africa who has used his powerful intellectual acumen to mesmerise the world community. Muammar Gaddafi: A colorful and influential leader in Africa. No matter what you might say or think of Gaddafi, nobody can deny his influence in Africa. He is political savvy and made the strategic move of re-establishing relationship with the West. He played a significant role in the formation of African Union. The most recent summit between Africa and Europe was held in his capital city, Tripoli, Libya. Kase Lawal: The founder of CAMAC International and the chairman of Camac Energy, a NYSE /AMEX Company. A business baron and 21st century business executive. His prominence in the global business scene has become something of great interest to African and he has become a role model to aspiring business executive in Africa and in African American community. Aliko Dangote: The founder of Dangote Group. Forbes magazine documented him as the richest Nigerian business executive. An intelligent and modern African business tycoon, whose conglomeration/empire has given thousands of jobs to Africans. Philip Emeagwali: The inventor of the fastest computer. Philip Emeagwali has been called “a father of the Internet” by CNN and TIME, and extolled as a “Digital Giant” by BBC and as “one of the great minds of the Information Age” by former U.S. President Bill Clinton. Nduka obaigbena: The founder and chairman of Africa’s widely read newspaper named ‘Thisday’ and flagship magazine 'Arise', an international voice of Africa. His influence stems from his unflinching and sustaining commitment to African culture in the globalized media. Jerry Rawlings: The former president of Ghana made the greatest impact on this West African nation after Kwame Nkrumah. He made radical reforms that transformed Ghana to a progressive capitalistic democratic society. His influence has not waned, he still plays vital role in cessation of conflicts in Africa especially at the ongoing fracas in Ivory Coast. Mo Ibrahim: The Sudanese business mogul and billionaire. His commitment to democracy and good governance drove him to create a foundation that monitors and rewards good governance for African Heads of States. Africa Political & Economic Strategic Center (AFRIPOL) is foremost a public policy center whose fundamental objective is to broaden the parameters of public policy debates in Africa. To advocate, promote and encourage free enterprise, democracy, sustainable green environment, human rights, conflict resolutions, transparency and probity in Africa.